On today's episode we have a unique guest. We were connected through Ulrike of the Impact Club (shouts out!) and I have enjoyed getting to know her over the last couple weeks. My guest is Theresa Lankes, she's a human rights lawyer from Germany. Her passion and fascination is with tensions in the burgeoning field of corporate social responsibility, where companies function between the dual obligations of profit and human rights. She studied in the UK how corporate management can consider human rights and has implemented campaigns for human rights corporate responsibility at the umbrella organization of Fair Trade. And She produces her own blog on CSR and human rights called Bizolutioners. In this episode, we dive into what CSR is and how we can live happy lives while also caring more about our personal supply chains. But before we get into that, I also want to note that Theresa selected the song that you hear playing, it's a big pop hit called "Crazy" by Lost Frequencies & Zonderling. She loves it precisely because she believes that the song is a trap! We should be wary about giving our everything because it can lead to unhealthy habits and burnout. For example, people who are negative give everything to be pessimistic in their future. There is a danger if you engage in this to burn out. Chose this song because it is a good reflection on how many people make themselves crazy by trying to change others so we will try to shirk this here. black-white picture of people either taking up the individual responsibility to "save the world" and getting frustrated by the mission or the rejection of the mission by others, who argue that it is impossible to change anything. 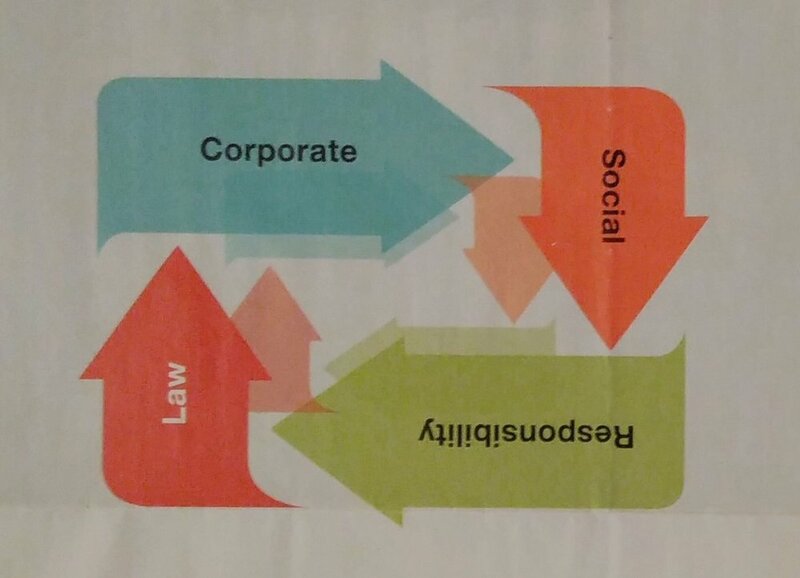 CSR as something which is separate from charity, but includes legal responsibility for fair wages and working conditions at subcontractors; this responsibility is directed by the social welfare state via legislation and enforced by courts. If you look at your own shopping habits like a company looks at its supply-chain, where is an area which you could influence within your limited time, energy and budget? Maybe you have a very limited budget and buying second-hand clothes suits with your lifestyle, too? Or you want to take a practical step against the tobacco supply-chain exploiting child labor and take this as an extra incentive to stop smoking? Or you notice that you shoe-shop when you're stressed out, so you could cut down on non-required consumption if you give yourself time to do nothing, absolutely nothing at all. Note: Theresa would suggest focusing on only one area to stress the point of using leverage with fun at a point which does not involve great stress and anxiety. The objective is to avoid piling on additional pressure to perform to a set standard of ‘being good’ by ‘consuming correctly’. Underlying is the idea that most people are already more than maxed out by the demands of daily life. Hence, we do not help saving the world by piling on even more stress. ; taking away pressure for creating the space to avoid harm and/or build solutions. Erik Douds and I met while studying abroad in Denmark. It was a long time ago, but even then he seemed on a mission. Having been diagnosed with diabetes at a young age, he was really drawn to help others like himself who suffer from this. But not to help in the traditional sense, the one that takes pity on those who have to work a little bit harder in life, but instead he wants to turn diabetics into DIABADASSES, but it's not enough for him to just talk about it, write about it, or to just create an online community about this (all of which he has done, I might add) but after being compelled by those in his online community to go out into the world to spread his message. He packed up his bike and did an entire year of travel around the US and Canada connecting with other Type 1's, friends, family, and strangers to share his story and experience and to empower those around him. If it isn't obvious from our discussion, Erik is an incredibly charismatic and energetic guy. It therefore should be completely unsurprising that he has managed to bike into a town a stranger, and leave a member of a community. We talk about travel, we talk about biking, we talk about Amtrak, we talk about diabetes, we talk about movements, we talk about people, we talk about small town and big town America, but at it's core what we really discuss is how to connect with people on topics that matter to you and the power of sharing stories. Erik is a walking (or riding depending on the day) inspiration and this is just the beginning. But let’s get into it - ladies and gentlemen Erik Douds, Diabadass Extraordinaire. Get Involved with the Diabadasses! Edited by the one and only, Alison Morales! Andrew Cassara is a Canadian -born singer and songwriter. He is based in Ottawa, Ontario, Canada, and with dual citizenship in the U.S.A., he frequents is family home in Vero Beach Florida. In 2013, Andrew signed a production deal with his current producer, Steve Gardiner of SGMGRoupArtists, and has been writing and recording music consistently for his own releases as well as for other artists. Under a development deal with SGMGRoupArtists, Andrew has developed a very strong presence online, and with a significantly engaging social media influence, he has established an ever growing world wide fan base. Over the summers of 2016/2017 and now 2018, Andrew and his band have become a familiar sight at many summer festivals, and in 2017, Andrew headlined the Youth X Canada Tour, which had him performing at Youth Centres across Ontario in support of an open and honest dialogue on the subject of Youth Mental Health. In the current year, Andrew’s most notable performance will be at the Ottawa RBC Bluesfest sharing the main stage with Shawn Mendes. Andrew tends to spend most summers performing live, but his focus is shared by a great deal of studio time, writing and recording new music. With an ever developing team of professionals in his camp, Andrew continues to write and release new music and with each release, his reach stretches further. His team is looking for touring opportunities with already established artists. To date, Andrew has released an E.P. as well as a dozen or so singles, and there are plans for an album release towards the end of 2018. In the meantime Andrew continues to take his music to live audiences and with an ever-growing fan base.